A.	Pursuant to amendments to La. R.S. 13:352 which became effective on July 1, 2015, the Fifth Circuit adopts the fee schedule applicable to all civil filings in this Court. This schedule may be updated periodically according to law. B. The fee for copies of opinions or parts of the record made by the clerk shall be two dollars ($2.00) per page. Adopted effective July 1, 1991. Amended effective Oct. 16, 2001; July 1, 2006. C.	The fee for a disc of the district court appellate record will be thirty-five dollars ($35.00). Adopted effective October 1, 2015. Effective January 1, 2016, all filings other than filings transmitted electronically shall be the original and three copies. In addition to any other sanctions imposed by court rules for untimely briefs, in every civil case when the appellant's or appellee's brief is not filed by the date the brief is due, a fine of One Hundred Dollars ($100.00) shall be imposed and shall be paid prior to the filing of the brief. Adopted effective Jan. 1, 1992. The parties shall be allowed a period of time not to exceed 30 minutes, divided equally between opposing parties, unless additional time is allowed by the court for sound reason, or the court deems additional time is needed for proper presentation of the case. Counsel is not required to use all of the allotted time. The time for argument may be shortened in the discretion of the court. When there is a conflict of interests between appellants or between appellees, the court will decide upon the apportionment of the time allowed them for argument, unless they agree upon the apportionment. Adopted Oct. 17, 1995, effective Jan. 1, 1996. All criminal defense briefs filed with this court shall contain a Certificate of Service, properly setting forth service has been made upon opposing counsel and the defendant showing how and when such service was accomplished. All pro se filings with this court shall contain a Certificate of Service indicating that service has been made on current counsel of record for the defendant, if any, and counsel for the State showing how and when such service was accomplished. Any filings submitted without the proper Certificate of Service may be rejected by the clerk of court and returned to the filing party. Waiver of Service by Mail. Registration with this Court's Electronic Court System constitutes (1) waiver of the right to receive notice by first-class mail and the right to service by first-class mail or personal service and (2) consent to receive notice electronically and consent to electronic service. Waiver of service and notice by first-class or certified mail applies, but is not limited, to docketing information, orders, abandonment letters and writ grant decisions. Convenience Fee. A convenience fee of $35.00 will be imposed for each document or pleading which is electronically filed. Electronic Signatures. 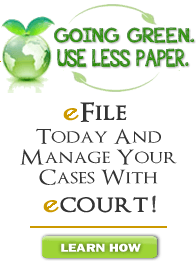 The judges of this Court are authorized to use electronic signatures on all court documents in accordance with law. Rule 9: Oppositions to Writ Applications must comply with Uniform Rules, Courts of Appeal, Rule 4-5(B). A. Any opposition to an original application for writs shall be signed by the respondent or counsel of record, and shall contain an affidavit verifying the allegations of the opposition and certifying that a copy has been transmitted or mailed to the respondent judge and to opposing counsel, and to any opposing party not represented by counsel. The affidavit shall list all parties and all counsel, indicating the parties each represents. The affidavit also shall list the addresses and telephone numbers (if available) of the respondent judge, opposing counsel and any opposing party not represented by counsel. B. The original and duplicates shall have the pages of the opposition and attached documents and exhibits consecutively numbered. The entire submission shall be hole punched and bound in two places along the top margin, preferably with 4-1/4 inch metal file fasteners such that no part of the text on any page is obscured, and in sections consisting of no more than 250 pages. No tabs shall be used in lieu of consecutive page numbering and no tabs or extensions shall be placed outside the paper dimensions. Documents within the bound submission shall not contain any staples, clips or other fasteners. the assignments or specifications of errors, Rule 4-5, Subsection C(5). D.	Oppositions to writ applications filed electronically with this Court shall be in accordance with the rules and procedures applicable to electronic filings, and shall be in compliance with the provisions of this Rule where applicable. The appellate record must be returned with the appellate brief in order for the brief to be considered timely filed. When a brief is filed electronically, the record must be returned on the day the brief is filed or before close of business the following day for the brief to be accepted and considered timely filed. Failure to return the record timely may result in rejection of the filing, imposition of late fees and forfeiture of oral argument. See, Uniform Rules-Courts of Appeal, Rule 2-12.12. Rule 11: Electronic Audio and Video Evidence. 1. All electronic audio and video evidence submitted to the Court shall be in the Windows Media Audio (WMA) or Windows Media Video (WMV) format to ensure that the evidence can be played on the default Windows Media Player. 2. In the event that audio or video evidence cannot be converted to the required formats, the software or codec required to view that evidence must be provided. This must include a description of the software or codec and instructions on how to install and use the software. Counsel for the parties must also inform the Clerk of Court in writing of these circumstances within five (5) days of the lodging of the record. It is the exclusive responsibility of counsel for all parties to ensure that all electronic audio and video evidence works properly before submitting it to the Court. Adopted by the Court En Banc on May 10, 2018, effective on June 1, 2018.